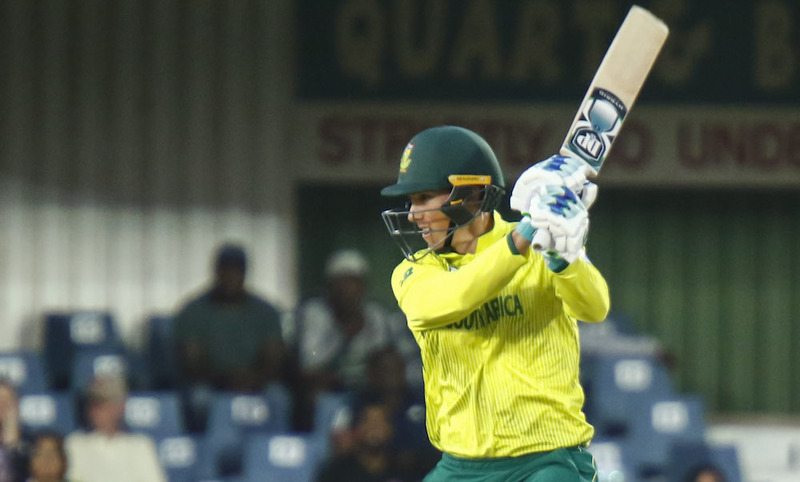 Rassie van der Dussen scored a half-century on debut to guide the Proteas to 160-6 in the first T20I at Buffalo Park. The Proteas handed opportunities to two new debutants – the Warriors’ 26-year-old batsman Gihahn Cloete and Lions top-order batsman Van der Dussen. Unfortunately, it wasn’t a great start for Cloete, who could only manage to score two, nicking Kyle Jarvis to Hamilton Masakadza in the slips. De Kock (five) followed shortly after, top-edging a pull shot to the leg side and Chamu Chibhabha took a simple catch. Despite the double blow, the Proteas continued to display their new attacking approach through Du Plessis who slammed two sixes in the third over, taking off pressure after being 11-2 in 11.3 overs. The Proteas were reduced to 52-3 as Du Plessis picked out deep extra-cover after a 20-ball 30 (five fours, two sixes). Van der Dussen played spectacularly. The 29-year-old smashed five fours and a six for his 44-ball 56, two of those fours coming consecutively to take him to his maiden fifty in 39 balls. Miller attempted to follow suit and supported the debutant well, contributing 39 off 34 balls (two sixes and a four) to their 87-run partnership, but he was caught at long-on attempting to clear the boundary. Van Der Dussen lost his scalp similarly to Miller, attempting to clear the rope but instead scooped the ball in the air to Masakadza at mid-off. Christiaan Jonker only managed eight, before middling a drive straight to Masakadza for a blinder at extra cover. Jarvis and Chris Mpofu bowled economically to restrict the Proteas to 160-6 in 20 overs. South Africa innings 160-6 – Rassie van der Dussen 56, David Miller 39, Kyle Jarvis 3-37, Chris Mpofu 2-24.